Did you know that kitchen remodeling projects offer a higher return on investment for homeowners than most other home improvement projects? 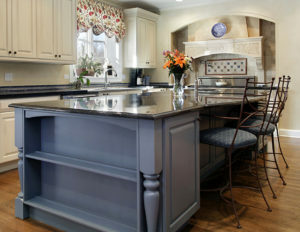 We at Pacific Kitchen Bath & Flooring have established a reputation as one of the best full-service contractors in the South California area because we understand that your kitchen is, more often than not, the heart and soul of your home and no small part of its value. Regardless of the amount of remodeling required for your kitchen, you can be sure that our service associates are up for the job. From putting in new flooring, to installing custom frameless kitchen cabinets, to resurfacing counter tops and back splash panels, we can bring all of your treasured kitchen design ideas to life. The best kitchen remodeling in Orange County starts with simply a phone call with one of our customer service representatives. We’ll take your kitchen wants and needs into consideration, and then visit your home to make the necessary measurements and evaluations. From there, we’ll move on to the design phase, where we create a plan of action to make sure your ideas for kitchen remodeling in Orange County all come true. Once we’ve decided on the best materials and products for your project, we’ll move on to the construction phase of your remodeling project. To bring you the very best in kitchen remodeling services, we at Pacific Kitchen Bath & Flooring use only the most widely recognized brands and products for every project, and we take every aspect of your kitchen into consideration. For starters, consider countertops – we offer granite, quartz, and many other beautiful and exceptionally durable materials. For cabinets, we offer a wide variety of framed and frameless varieties to suit the mood and color scheme of your kitchen. Since 2015, we at Pacific Kitchen Bath & Flooring have been providing exceptional kitchen remodeling services to Southern California’s most discerning residents. That is why our customers continue to return to us time and time again. Just take a look at their testimonials to see what our valued customers have had to say about our work. If you think a kitchen makeover, bathroom and/or shower remodeling, project is what your home needs, don’t hesitate to give us a call or write us a note via our contact page . Our friendly and professional team looks forward to serving you. At Pacific Kitchen Bath & Flooring, we pride on ourselves on providing a truly outstanding selection of countertop materials, including marble. Marble is a metamorphic stone that is formed when limestone is exposed to great amounts of heat and pressure. The mineral deposits found in the natural stone give it its distinctive veined pattern. Marble is usually white, grey or beige in appearance but can also come in a variety of other colors. A marble countertop is ideal for a home renovation due to its classic beauty and versatility, and it is typically preferred for a bathroom or kitchen renovation. Marble countertops can come in two finishes. A honed finish takes a smooth and matte appearance that make any scratches or blemishes less noticeable. A polished finish is more resistant to stains and imperfections while giving the countertop a shiny and glossy appearance. Maintenance for marble countertops is simple. Sealing it before installation and once a year after prevents the marble from staining and changing in color caused by liquid spills, food or other materials. Avoiding acidic liquids, like lime juice, from coming into contact with a marble countertop can also prevent it from absorbing deep stains. It can also protect it from surface markings. Cleaning marble countertops only requires a small amount of soap and a pre-moistened cloth. While it is possible for marble to age over time, many homeowners enjoy the lived-in appearance of their aging marble countertops. However, with regular maintenance and upkeep, marble countertops can keep looking just as new and polished as when they were first installed. Pacific Kitchen Bath & Flooring is proud to offer a range of countertop materials that are both beautiful and functional, including quartzite. A quartzite countertop is made up of a highly durable and natural metamorphic rock that originally takes the form of sandstone. It also contains quartz; the mineral responsible for that special natural stone sparkle. Quartzite is typically white or gray in color. Quartzite countertops are ideal for kitchen or bathroom renovations as its natural colors and quality are long lasting and extremely resistant to scratching and breaking. Quartzite is actually harder than granite and is extremely durable. It is also able to withstand high levels of heat. Placing hot pans on the countertop will not do any damage to the stone. In addition, the quartzite’s pattern and color remain intact even in extremely high or low temperatures. A quartzite countertop is ideal for those who want to have the appearance of natural stone in their kitchen or bathrooms. Very little maintenance is required for quartzite countertops. However, they must be sealed every few years in order to avoid set -in stains and to prevent damage from water or other abrasive chemicals. Clean up is fairly simple and only requires a damp washcloth to wipe away any liquids or dirt. Our highly skilled and extremely experienced contractors can install the perfect quartzite countertop for your kitchen or bathroom renovation. When it comes to providing countertops made of quality materials, such as limestone, we at Pacific Kitchen Bath & Flooring can help homeowners upgrade their kitchens or bathrooms to fit the design they have in mind. Limestone is a heat-resistant natural stone that is typically light in color. Although limestone is an attractive countertop choice, it also requires some additional effort to maintain its lustrous appearance. As one of the more porous natural stones in comparison to marble and granite, limestone needs to be professionally sealed with a water-based sealant during installation, and every year following, in order to prevent staining. If properly maintained and cleaned, limestone countertops can retain their natural beauty indefinitely. It is best to clean limestone countertops with products that are specially designated for limestone countertops or with warm water and mild detergent. It is also important to use a soft washcloth rather than a sponge or other rough materials that can potentially scratch and damage the surface. Moreover, it is also recommended to protect limestone countertops from getting into contact with sharp utensils by using cutting boards and placemats while cooking or eating. To avoid staining, limestone countertops should be wiped clean immediately after a spill occurs, especially if acidic liquids come into contact with the countertop. If a stain should occur on a limestone countertop, a store-bought or homemade poultice made by mixing flour and hydrogen peroxide can safely and effectively remove the stain without further damaging the countertop. Pacific Kitchen Bath & Flooring: The Place for Limestone!